Add some romantic mood to your outfit with this dazzling fashion bracelet. Featuring two intersected open hearts, pave set in clear Swarovski crystals, attached to a wide plastic bangle with black leather cords. 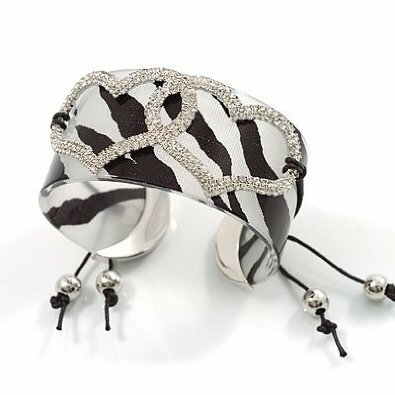 The cuff has a Zebra print and hanging beads in silver tone, to add a morden touch. One Size Bangle: will fit up to approx. 22cm wrist. Width: 4cm.